Audioboom / Videogame BANG! Live Episode 4: The Great Debate! Videogame BANG! Live Episode 4: The Great Debate! Live from California its the Videogame BANG! Live! and what a show we have for you today peeps. Sir Aaron Carter bring the new hotness that you will be rushing to the store to pick up. Along for the ride we have Cory V, The Real David Webb, and Steven G. They all have their expectations of the this year of gaming and Sir Carter tries his best to see if they will be met. They show starts out with a rousing debate on the state of gamers, and the definition of casual gamers. The chat room gets involved heavy and the situation gets taken to 11 for some, but all on good sport. 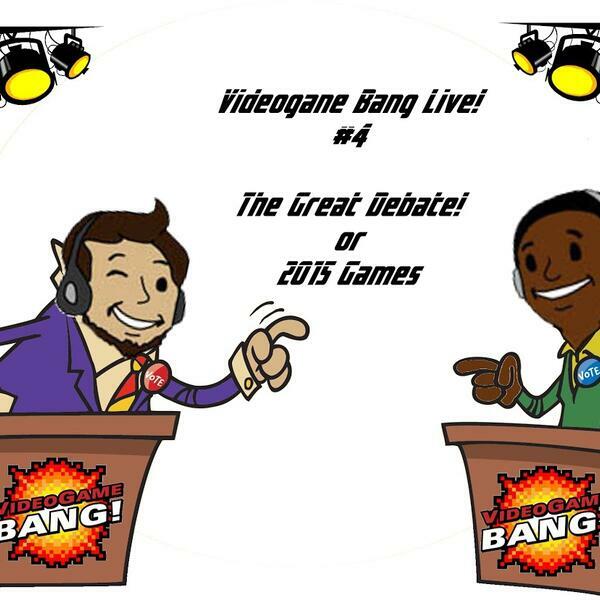 After the 2015 list we get right back into the debating with the live show, and we get into it all from movies to trolls of the internet, VGB live takes on the great issues of the world. Will Donald Glover be the next spider-man? Will everyone die in the Walking Dead? Did Sir Carter and Cory agree on anything? Find that all out and more on this weeks Videogame BANG! Live!